The Wells Fargo Cinco de Mayo Fiesta at Falls Park is excited to celebrate its 12th year in Sioux Falls. The celebration will include free music and feature a Kid’s Zone – an entertainment area for children with free piñatas, inflatables and more! In addition, nearly a dozen local vendors will offer a variety of ethnic foods – from fajitas and tacos to beans and rice, burritos and more – along with soda, water, ice cream and alcoholic beverages. All proceeds raised from the event help Caminando Juntos ministries of the Presentation Sisters, a non-profit agency providing services to the Sioux Falls Latino community, such as ELL classes, advocacy, networking, counseling and immigration services. 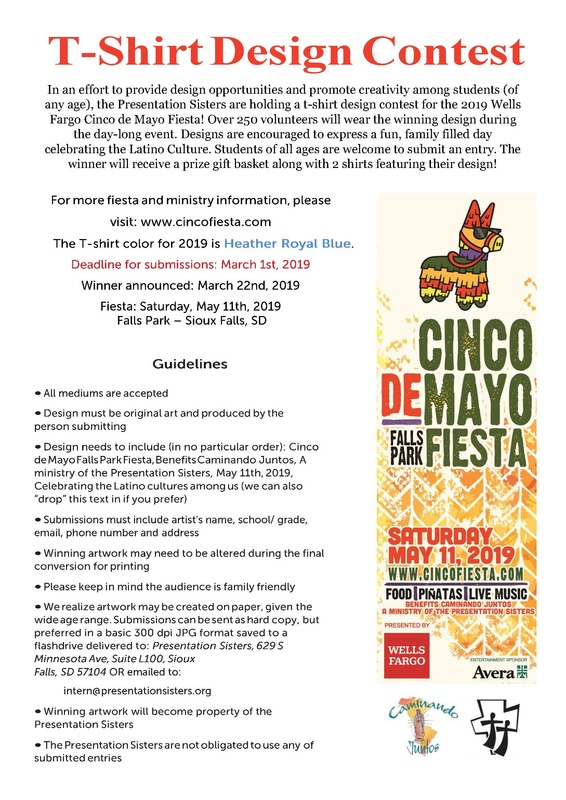 In an effort to provide design opportunities and promote creativity among students (of any age), the Presentation Sisters are holding a t-shirt design contest for the 2019 Cinco de Mayo Fiesta! Over 250 volunteers will wear the winning design during the day-long event. The winner will receive a prize gift basket along with two shirts featuring their design! Learn how to submit a design here.